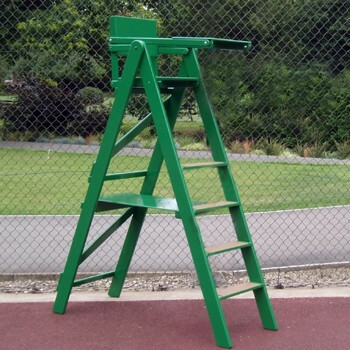 Our sturdy timber Tennis Umpire's Chair combines good looks and ease of handling. The seat is 1.5m high giving a clear view of play and is supplied complete with a desk. It has arm rests and 4 steps which are covered with anti-slip rubber tread. The seat, which weighs 26kg, folds for storage. As standard this seat is finished in green, but can be supplied in other colours if required.